The recipe (from the book that brought us the disastrous slow-cooker banana bread) calls for a lot more of some things and a lot less of some others, but I ended up throwing most of the veggies in my fridge leftover from this recipe into this one and it was delicious. Great big pot o’ goodness. Melt 2 tbsp oil (I used coconut) in the bottom of a large soup pot on medium heat. 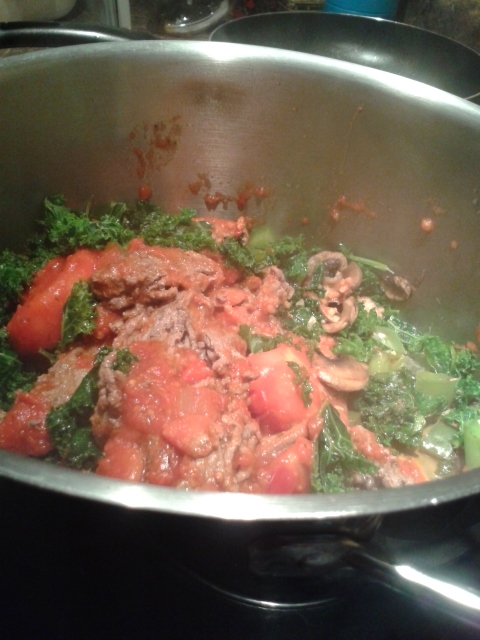 Add the carrots, onion, green pepper, garlic, kale, and mushrooms and saute until the veggies are tender. While the veggies cook, brown the beef on medium heat in a separate skillet until fully cooked. Add the beef to the pot (I left in the grease, because I am an animal it tastes better). Add the remaining ingredients except for the butternut squash, mix well, and simmer for 30 mins. Okay, here comes the weird part, because I had never done this before. It was surprisingly easy, and only caused me to rattle off two strings of expletives over the course of 10 minutes! I am improving! PEEL YE SQUASH. 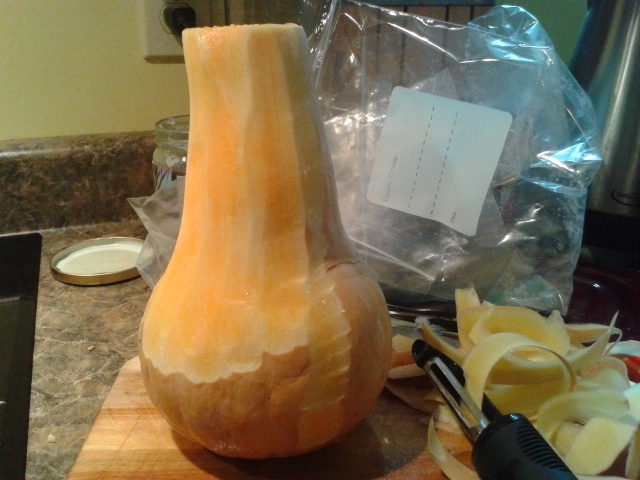 For this, I used a regular veggie peeler, just chopped off the top and the base of the squash with a knife for stability. I had to peel several layers before getting down to the bright orangey inner goodness. CHOP YE SQUASH. Lengthwise, or into semicircles. I found the semicircles easier to cut (I just slit it down the centre, then commenced le chopping), and in terms of placing them in the crock pot, since it is circular. Alright, now you are ready to put it all together (once the meat sauce has simmered long enough, that is). 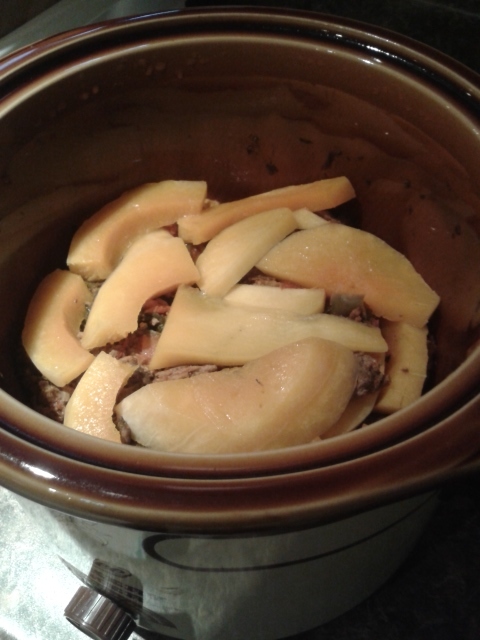 Ladle a layer of meat sauce into the slow cooker, then evenly spread squash slices on top of it. Continue to alternate in this pattern until you run out. Fewer layers run the risk of burning, though I only got to about 4 layers before the sauce ran out, and now I have a few pieces of leftover squash sitting all lonely in my fridge. Cover, and cook on low for 6 hours. You will know it’s done when a fork can easily pierce the squash. This is delicious. It’s not exactly like lasagne (lasagna? the book spelled it like that; I suppose it’s an Americanization? 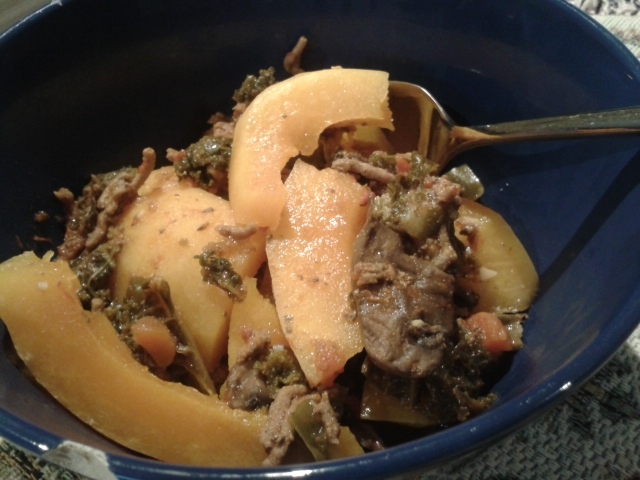 ), in that the layers don’t really hold together cohesively, but it’s delicious and hearty. I ate this for like a week and a half. It refrigerates well.